The Long Awaited M2M Crowd Funding Script is Here! 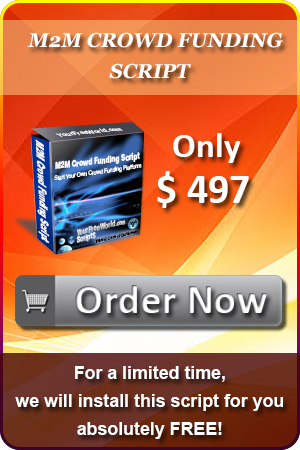 What’s New in This M2M CrowdFunding Script? The Donations Payout System is Instantaneous. There are No Hidden Fees. The Full Amount Goes to You. You can Refer to Anyone to Fund Your Project/Product. The Transactions are Completely Secure and directly paid in a peer to peer way. You can also use this script to make the world a better place by collecting fund for a good cause. There is no limit to what you can do with this matrix script i.e. the possibilities to use this matrix script are limitless since you can create multiple matrices for multiple crowdfunding projects, and nobody would stop you for doing that. As always, the installation of the M2M Crowdfunding Script is very simple and takes less than an hour to set-up. Since the script is completely autonomous, you have the freedom to tweak or improvise the matrix script that meets your expectations. Complete autonomy and freedom to adapt the program to your own requirements. Setup payment details for Payza, Bitcoin and up to 5 other merchants of your choice. Set how many days to wait before purchases are automatically approved. Choose the matrix of your choice that members start off in with their first purchase. Set whether members can purchase more than one matrix position. Set the maximum number of positions in any matrix that members can purchase. Ability to allow members to purchase higher positions in higher matrices without reaching that position or not. Choose the number of banners to display at the bottom of each page, and the number of text ads to display at the top of each page. - member payment declined notice emails. Edit Your Pages by placing the HTML code into the system for the Ad Purchase Thank You, FAQ, Home, Logout, Member's Area Home and Terms pages. Set the membership fee to join each matrix. Setup the number of bonus text ad credits a member receives when purchasing a position in a particular matrix. Setup the number of bonus banner ad credits a member receives when their position in a particular matrix cycles. Add the HTML code for the bonus download for each matrix. Choose whether to send a welcome email for matrix position purchase, and edit the contents of that email. View/edit and delete existing matrices. View the specific details of each matrix that you've created including the user ID, username, matrix upline user ID, referral numbers on each level up to 10, total earnings to date, purchase date, activation date, and delete position function. View pending member gift payments including the transaction ID number, from username, to username, payment details, amount, matrix number/position/ID, transaction date, and approve or delete gift function. View all the approved member gift payments with the above details, and delete gift function. Add purchased banners or text ads manually. View pending and approved purchased banners or text ads, with approve or remove functionality. - Approved/Pending testimonials, transactions, gifts, banners, text ads, promo banners/solo ads.